Using the exquisite sensitivity of the National Science Foundation's Robert C. Byrd Green Bank Telescope (GBT), astronomer Jay Lockman of the National Radio Astronomy Observatory (NRAO) in Green Bank, W. Va., has produced the best cross-section ever of the Milky Way Galaxy's diffuse halo of hydrogen gas. This image confirms the presence of discrete hydrogen clouds in the halo, and could help astronomers understand the origin and evolution of the rarefied atmosphere that surrounds our Galaxy. Lockman presented his findings at the American Astronomical Society meeting in Seattle, WA. "The first observations with the Green Bank Telescope suggested that the hydrogen in the lower halo, the transition zone between the Milky Way and intergalactic space, is very clumpy," said Lockman. "The latest data confirm these results and show that instead of trailing away smoothly from the Galactic plane, a significant fraction of the hydrogen gas in the halo is concentrated in discrete clouds. There are even some filaments." Beyond the star-filled disk of the Milky Way, there exists an extensive yet diffuse halo of hydrogen gas. For years, astronomers have speculated about the origin and structure of this gas. "Even the existence of neutral hydrogen in the halo has been somewhat of a puzzle," Lockman remarked. "Unlike the Earth's atmosphere, which is hot enough to hold itself up against the force of gravity, the hydrogen in the halo is too cool to support itself against the gravitational pull of the Milky Way." Lockman points out that some additional factor has to be involved to get neutral hydrogen to such large distances from the Galactic plane. "This force could be cosmic rays, a supersonic wind, the blast waves from supernovae, or something we have not thought of yet," he said. Earlier this year, data taken with the newly commissioned GBT demonstrated that rather than a diffuse mist or other ill-defined feature - as many astronomers had speculated - the halo was in fact made up of well-defined clouds. "The discovery of these clouds, each containing 50-to-100 solar masses of hydrogen and averaging about 100 light-years in diameter, challenged many of the prevailing theories about the structure and dynamics of the halo," said Lockman. The clouds were discovered about 25,000 light-years from Earth toward the center of our Galaxy. The latest findings show the clouds extend at least 5,000 light-years above and below the Galactic plane. Though the initial studies by Lockman revealed the presence of these clouds, the data were insufficient to conclusively show that they were present throughout the entire halo. These latest results provide valuable evidence that the earlier results were truly representative of the entire halo. "The richness and variety of this phenomenon continues to astound me," remarked Lockman. Lockman's new studies also confirm that these clouds travel along with the rest of the Galaxy, rotating about its center. These studies clearly rule out the possibility that so-called "high-velocity clouds" were responsible for what was detected initially. High-velocity clouds are vagabond clumps of intergalactic gas, possibly left over from the formation of the Milky Way and other nearby galaxies. "One thing that is for certain is that these are not high-velocity clouds, this is an entirely separate phenomenon," said Lockman. According to the researcher, the ubiquitous nature and dynamics of these newly discovered clouds support the theory that they are condensing out of the hot gas that is lifted into the halo through supernova explosions. When a massive star dies, it produces a burst of cosmic rays and an enormous expanding bubble of gas at a temperature of several million degrees Celsius. 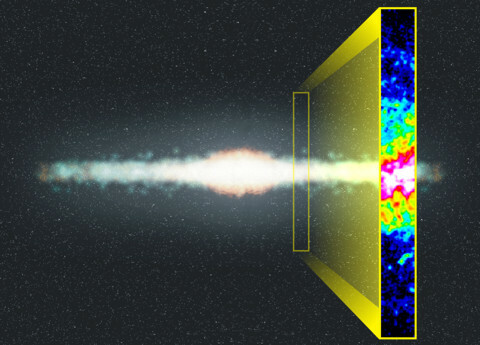 Over time, this hot gas will rise into the Milky Way's halo. The results presented by Lockman suggest that, as some astronomers have predicted, the hot gas in the halo slowly cools and condenses into hydrogen clouds along with wispy filaments that connect them. When these clouds become as massive as many of those discovered by Lockman, they should then begin to fall back onto the Galactic plane. This phenomenon is commonly referred to as a "galactic fountain." "If the clouds were part of the galactic fountain process," Lockman said, "then it is likely that they are now falling back onto the Galaxy." Radio telescopes are able to detect the naturally occurring radio emission from neutral atomic hydrogen. As hydrogen atoms move about in space, they can absorb small amounts of energy, sending the atom's single electron to a higher energy state. When the electron eventually moves back to its lower energy -- or resting state, it gives up a small amount of electromagnetic radiation at a wavelength of 21 centimeters. The GBT, dedicated in August of 2000, is the world's largest fully steerable radio telescope. Its 100 by 110 meter dish is composed of 2004 individually hinged panels. It also has a unique offset feed arm, which greatly enhances the performance of the telescope, making it ideal for observations of faint astronomical objects.